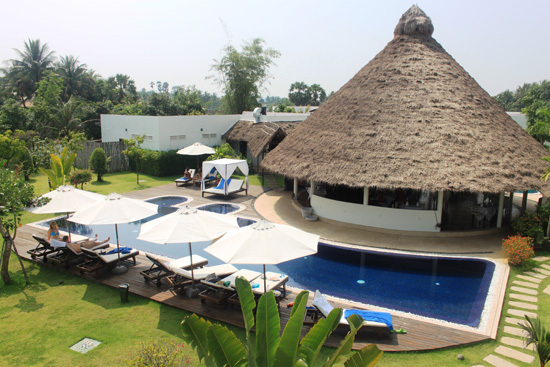 A chic boutique retreat on the outskirts of town, Navutu Dreams Resort and Spa is well suited to those looking to indulge in a little luxury and linger a little longer in Cambodia to enjoy the surrounds as well as the temples. Average rating 8.8 from 286 reviews. Blending a Mediterranean style with lush tropical gardens, Navutu Dreams offers a chance to focus on health and wellbeing too, with a spa, health and detox programme, yoga centre and healers. That said, one shouldn’t miss out on the chance to tuck into some of the authentic Italian dishes offered at the resort’s open-air pavilion restaurant. Beachy bliss beauty, sans sand. A 15-minute (or so) tuk tuk ride from the centre of the town—relatively far in Siem Reap terms—it doesn’t take long to leave behind the dusty city streets and come upon the fringes of rural Cambodia, as you bump down a rusty red track to the property entrance tucked away in a quiet area. Here, you step into another world of whitewashed villas with languid arches that border three separate swimming pools and exude a distinctly Mediterranean vibe. 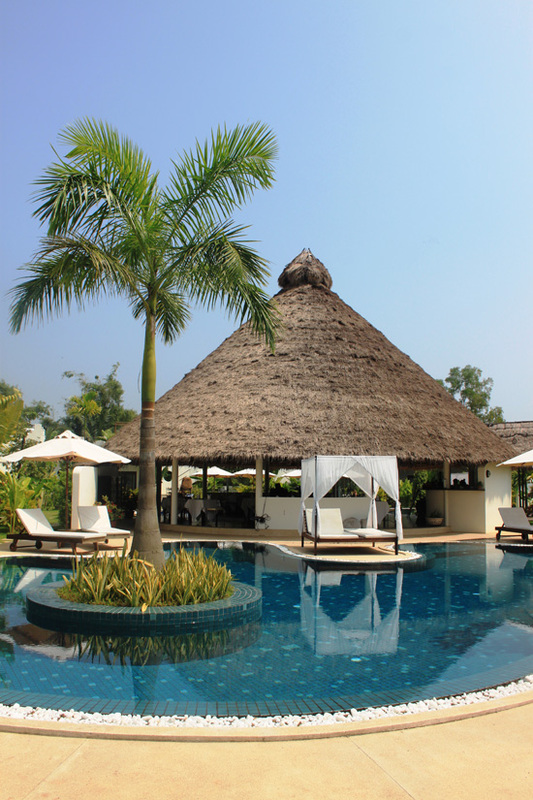 Take a dip in the alluring curved saltwater lagoon pools, divided from the rectangular fresh water lap pool by the dominant circular thatched roof of the restaurant. With a trio of Italian owners, the resort’s restaurant serves up both Cambodian and Italian cuisine. Villas lifted from the Med. Navutu Dreams embraces the resort ideal without losing intimacy and character partly thanks to its small size; it’s a place to relax and unwind without feeling the need to leave. With a spa on site, Navutu Dreams is developing a reputation as a health and wellness retreat, providing daily classes in its yoga studio with resident yoga teachers, a detox programme and access to a range of health healers who can provide treatments in the comfort of the resort’s spa rooms. The hotel has expanded since it first opened in 2011, and now offers 18 “explorer” rooms with 45 square metres of luxurious white space, offset by a cerulean blue back wall and regional artefacts. The private terrace doors open up to create an indoor/outdoor space with deck seating and a moulded sofa-area in coordinating shades of blue. Inside, the gorgeous stone showers are stocked with organic toiletries. Hidden behind rapidly maturing gardens, these rooms can also be joined so that families can stay in touch. Explorer rooms. Not far to explore that inviting pool. 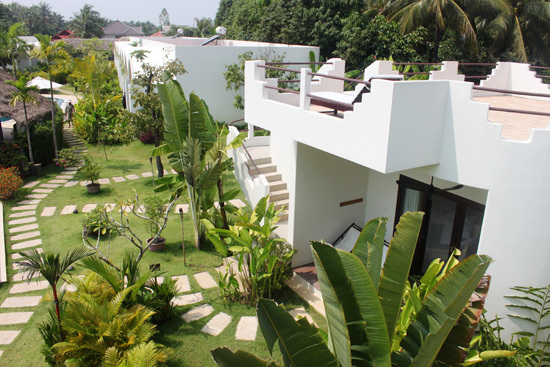 The six “grand tour” villas are in a similar beautifully conceived vein, with 70 square metres of space you’ll never want to leave, unless it’s to climb the external stairs for the private rooftop terraces which overlook the nearby rice fields and are a lovely setting for breezy sundowners. Another four suites form the newest part of the resort with 100 square metres of space, made up of a bedroom and separate living room, or alternatively two bedrooms, also providing a good solution for families. There may be no sea or sand, but there’s still sunshine. Despite being slightly further afield than more centrally located city-style hotels, the wonders of Angkor are made easily accessible as a designated tuk tuk driver for 12 hours a day is assigned to your room. Check their website or online agents for deals; rates vary by day of the week, and week by week, so we’ve quoted the lowest price available below. 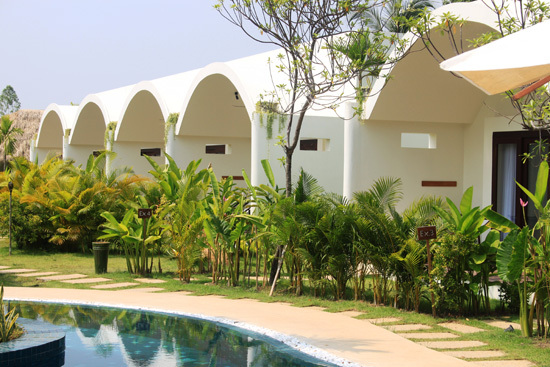 Check rates at Navutu Dreams Resort and Spa on Booking.com.